Rated 4.5 out of 5 stars.1384 total votes. Rated 4.5 out of 5 stars.141 total votes. 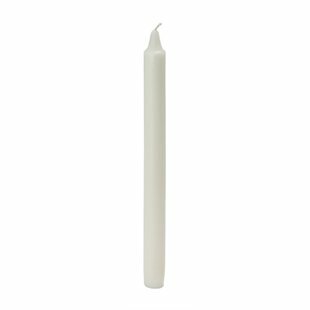 Set the mood, without worrying about melted wax, or open flames, with this one piece flameless pillar candle. It is battery operated, and requires two batteries to work (batteries not included). This dripless piece, eases the stress that comes with the melted wax of regular candles. It features a timer that can be set so it comes on at the same time each day and stays on for either 4 or 8 hours. The faux flame can flicker, just like a real beeswax candle. Rated 4.5 out of 5 stars.97 total votes. There’s nothing quite like candlelight to enhance the ambiance of any gettogether, whether it’s an intimate dinner or a holiday dinner with family and friends. Made in North America from 100% paraffin wax, this charming pillar candle is the perfect addition to any tablescape or mantel. Available in a variety of sizes to suit your decor needs, this elegant candle is unscented, ivory-hued, and features a single wick with a burn time ranging from 42 to 136 hours depending on the size. Rated 4.5 out of 5 stars.124 total votes. Rated 4.5 out of 5 stars.206 total votes. Overall Product Weight: 1.75 lb. Rated 4.5 out of 5 stars.40 total votes. 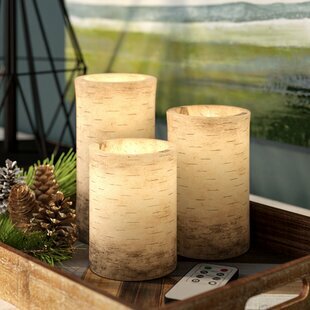 Modern Cylindrical Flicker Flameless Candle Set features two cylinder candlelight with distressed texture in finish, features ready to use standard-sized candles, features LED lights located in the core of the candles. Overall Product Weight: 1.8 lb. This jar candle is the perfect pairing of two of life’s greatest joys: champagne and candle. It’s the sparkling sensation you get when you hear the pop of a champagne bottle coupled with the warm glow of candlelight. It’s a cause for celebration, a little bit of luxury in the comfort of your home. All-natural, soy-based candle, is a flirty, feminine addition to any room in your home. And with a burn time of 75 hours, it keeps the glamour going strong. Rated 4.5 out of 5 stars.114 total votes. Overall Product Weight: 3.75 lb. Rated 4.5 out of 5 stars.90 total votes. Enjoy the simplicity of an unscented, fragrance-free candle. The sophisticated, smooth finish of Colonial Unscented Pillar Candles will add stylish color to your. Rated 4.5 out of 5 stars.343 total votes. These luxurious led candles are made to look like the real thing! With a wax look and feel, and a flickering led flame - there is no more need to worry about real flames. A remote is also included, with timing options and options to turn flickering on and off. Two AA batteries are required. Rated 4.5 out of 5 stars.21 total votes. Combining popular scents, this Scented Pillar Candle features a trio of ombre wax layers. Overall Product Weight: 0.57 lb. Rated 4.5 out of 5 stars.351 total votes. Enjoy the simplicity of an unscented, fragrance free candle. Colonial Candle Classic tapers are the perfect accessory for decorating and entertaining. Made from the highest quality wax, Classic tapers ensure a smooth, clean burning virtually dripless candle that burns slowly and evenly. The beveled base provides stability and support needed for most taper holders. This Realistic Flame LED Unscented Pillar Candle adds the warm ambiance of flickering candles to your home safely and without any messy drippings. Made of real wax, this creates a realistic flickering flame using a dual light beam, making them perfect for safe use in decorative arrangements and wreaths. Overall Product Weight: 0.98 lb. Mesmerizing freesia and delicate honey melange. Smells delicious enough to eat. Overall Product Weight: 1.9 lb. Star Hollow Candle Company's 16 oz quote jars come in many unique sayings and make nice gifts for any occasion. Made with a pure soy blend, dye free, and phthalate free wax. Overall Product Weight: 1.4 lb. This candle is a classic touch that adds simple elegance to any home. Overall Product Weight: 1.11 lb. Rated 4.5 out of 5 stars.85 total votes. This scented Pillar candles are an ideal choice for any occasion. They not only add a touch of elegance to your room, but also create a subtle and warm ambiance when lit. Overall Product Weight: 0.37 lb. Rated 5 out of 5 stars.34 total votes. Overall Product Weight: 0.55 lb. Rated 4.5 out of 5 stars.195 total votes. Designed to look like real candles, the 8 LED Votive Flameless Wax Candle Set is a great addition to any home. Get the classic, comforting look of a soft glowing candle without any drips, smoke, flame or safety hazards. Create the perfect ambiance for your home, wedding, dinner parties and more. Enjoy the subtle scent of vanilla while providing an elegant ambiance in any home or environment. Overall Product Weight: 1.45 lb. Rated 4.5 out of 5 stars.104 total votes. Rated 4.5 out of 5 stars.31 total votes. Overall Product Weight: 7 lb. Create a wintry haven indoors with this balsam fir scented pillar candle. Besides its soft pine fragrance, this decorative candle is characterized by a trio of ombre wax layers in earthys. Each pillar candle also comes wrapped with cord and an openwork leaf charm. Rated 4.5 out of 5 stars.140 total votes. Set the mood, without worrying about melted wax, or open flames, with this 12 piece set of flameless candles. Each candle is battery operated, and includes one battery per candle that lasts up to 45 hours of continued use, and can be easily replaced when needed. The faux flame of these candles blinks but does not move. Crafted from molded plastic, in a solid hue; this set can be used indoors or outdoors. Rated 4.5 out of 5 stars.72 total votes. Enjoy the simplicity of an unscented, fragrance free candle. 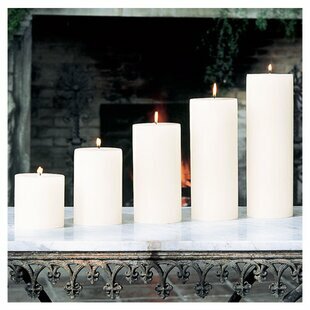 Colonial Candle Handipt Unscented Taper Candles are an excellent addition to an elegant dining experience. Made from the highest quality wax, the Handipt Unscented Taper Candle ensures a smooth, clean burning, virtually drip-less candle that burns slowly and evenly. This Citronella Giant Metal Bucket Unscented Jar Candle is great. This candle will burn for up to 300 hours so that you can enjoy it all summer long! The candle contains 3% all-natural citronella oil which has been proven to have highest efficacy rating. Overall Product Weight: 29.06 lb. Overall Product Weight: 2.2 lb. Rated 5 out of 5 stars.72 total votes. 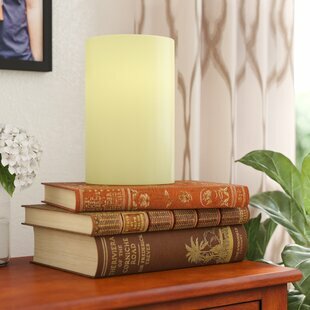 This Wax Pillar Candle offers beautiful and flexible indoor decorating possibilities. Flameless timer candles allow you to decorate in difficult to reach areas and places where traditional flame candles are inconvenient or simply cannot be used such as inside of bookcases or on window sills. Rated 4.5 out of 5 stars.13 total votes. Overall Product Weight: 1.93 lb. This Warm Cinnamon Buns Scented Designer Candle utilizes 100% natural American soybean wax. Cinnamon with a buttery cake scent. Classic and vintage is your style, so you'll love this beautifully scented candle. It comes in a delightful vessel reminiscent of old-world apothecary jars from Europe. The candle holder is topped with a gorgeous glass dome to preserve the fragrance, making it the perfect gift or decorative accent that will turn your wall space into a fascinating display of light. Overall Product Weight: 3 lb. Flameless, smokeless and long lasting, safe to use. These Incredibly realistic dancing flame LED candles, with flame simulation technology makes the candles sway and flicker so convincingly. No hot/dirty and dripping wax to deal with. Realistic light. Overall Product Weight: 0.75 lb. Rated 4.5 out of 5 stars.227 total votes. Nothing says ambience quite like a flickering flame, but having that open tinder isn't exactly safe. Get the glow without the worry with this set of three flameless candles! Showcasing the same design in three different sizes (6'', 5'' and 4'' tall, respectively), they each feature a beeswax design with a classic cylindrical silhouette. Battery operated and controlled by an included remote, they light up in hues of blue, purple, and green. Simple and elegant, bubble is sized just right to hold a tea light. Sprinkle these tiny glass holders over your tabletop or mantel. Rated 4.5 out of 5 stars.16 total votes. No longer will you have to put up with the annoyance of cleaning candle drips or worry about falling asleep without blowing the candles. The Holiday Aisle care about your safety, and a risk of fire shouldn't be a concern. No more dripping wax, no more smoke, and no more scent. These flameless candles will suit your every need. Overall Product Weight: 0.8 lb. Overall Product Weight: 3.4 lb. Rated 4.5 out of 5 stars.24 total votes. Rated 5 out of 5 stars.68 total votes. At Wayfair, we try to make sure you always have many options for your home. That's why we have so many candles for sale on our site, including candles from brands like Charlton Home and Beachcrest Home. 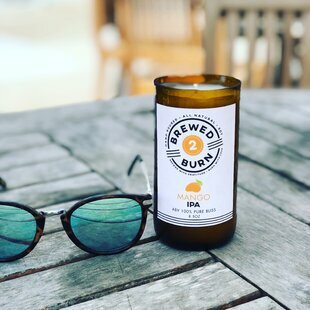 We want to make sure when you're looking for where to buy candles online, you're getting the one that's exactly right for you, whether that's the European Pillar Candle (Set of 4), the Unscented Votive Candle (Set of 100), or something entirely different and unique to your home. We have thousands of great deals every day with no need for a coupon. There's never been a better time to "Wayfair my candles".